East Coast Tarpon: The tarpon, also known as the silver king, is the undisputed king of the inshore gamefish. They are known for their extreme air shows when they are hooked. After they tire from jumping, they will stay in the water and bulldog the angler with brute strength. In east central Florida, the tarpon reside both in the estuaries (Banana and Indian Rivers) and along the inshore waters paralleling the Space Coast beaches. Mainly in the summer and fall, the tarpon hang out in the vicinity of the pogies and mullet that reside in the immediate surf and just offshore a mile or two. 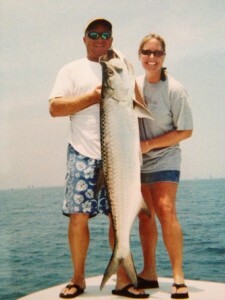 Tarpon Fishing Tips: Most often, the ocean going tarpon are targeted with live bait. Usually, we slow troll for them with live pogies which allows us to catch other fish like kingfish, jacks and sharks while waiting for a tarpon bite. Sometimes when the fish are rolling (coming to the surface to gulp air) it is possible to sight cast the live bait into the schools.